The information in the attached table is essential information for farmers and advisors, and the P2O5 and K2O values can also be found in the AHDB Nutrient Management Guide (RB209), 2017. The values shown are the agreed best estimates of the quantities of phosphate (P2O5), potash (K2O) and guidance of the magnesium (MgO) removed in harvested crop products and in by-products such as straw. These are the offtakes of P2O5, K2O and MgO per tonne of fresh material harvested; to maintain the nutrient fertility of the soil the total offtake must be replaced, through the use of fertilisers and manures (see below for examples of the calculations). * Offtake value is per tonne of grain or seed removed but includes nutrients in straw when this is also removed and weight is unknown. ** The magnesium offtakes are based on very limited data and are for guidance only. *** Use these values when straw weight is known. Potash content of straw can vary considerably – higher than average rainfall between crop maturity and straw baling will reduce straw potash content. Information on non-cereal straws is limited so values should be used only as a guide. In contrast to nitrogen, the recommendations for phosphate and potash fertiliser are based principally on ensuring that the soil has sufficient reserves of these nutrients to be able to supply all that the crop needs during growth. This is measured by soil analysis, and the Index system has been devised to allow easy determination of whether a soil has adequate reserves. For agricultural cropping a soil phosphorus Index of 2 or 3 and a potassium Index of 2 are generally considered sufficient to supply the full needs of the crop during its growth. Thus at these nutrient Indices the usual fertiliser recommendation, except for potatoes, is to replace the nutrients removed at harvest. These are calculated by multiplication of the given offtake values by the expected crop yield, and are called the ‘maintenance’ dressing. 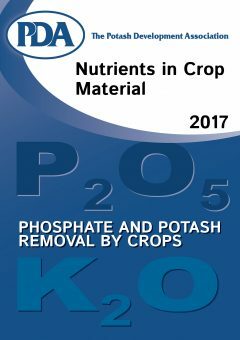 Where crop yield is expected to differ from the standard values in the Nutrient Manual, the P2O5 and K2O recommendations can be adjusted using these offtake values. For example, the standard recommendation of 90 kg/ha P2O5 for wheat at P Index 1 for an 8 t/ha crop should be increased by 2 x 7.8 = 15.6 kg/ha P2O5 to 116 kg/ha P2O5 if a yield of 10 t/ha is expected, and K2O similarly. The values in the table are the estimated nutrient offtakes. Particularly for potash, these quantities are very considerably lower than the nutrient uptake by the growing crop. The soil nutrient reserves must be sufficient for the crop to be able to obtain all the K2O it requires to reach its full yield potential and to ensure efficient use of N and other nutrients. So although for example an 8 t/ha wheat crop removes only about 45 kg K2O in the grain, the growing crop can contain 300 kg/ha K2O; this has to be taken up from the soil which therefore should be not lower than K Index 2. Much of K2O in the crop is returned to the soil as the crop matures, but a considerable amount is retained in the straw. If the straw is ploughed in this K2O is also returned to the soil, but if it is baled then the potash it contains is removed, along with that in the grain.